« The Blueberry and the Almond Cake! Four Days in Maja’s Kitchen! 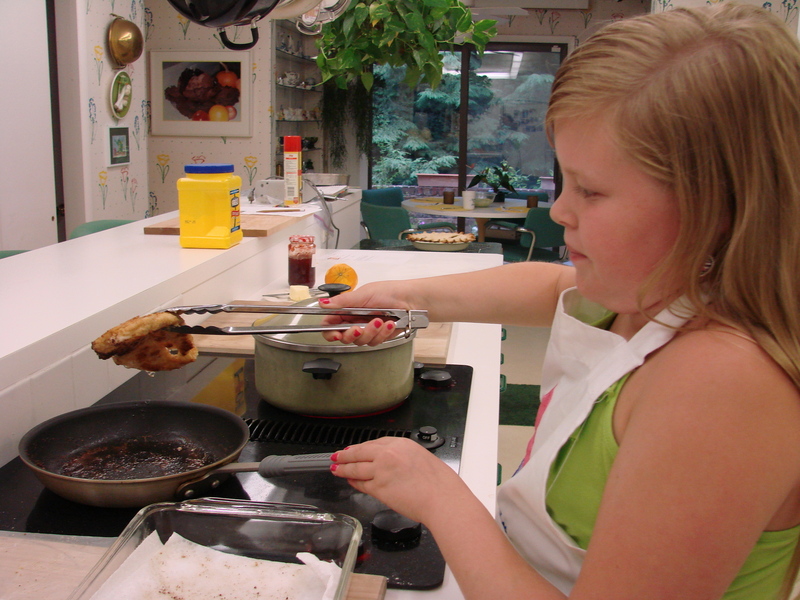 Eleven years old and already exhibits passion for cooking!!!!!!!! This was her first time away from home and was the most independent and pleasant little girl with an innate self-confidence, followed instruction precisely, was pleasant at all times, punctual, never had to wake her in the morning, she set her alarm clock when she went to bed and got up on time….showered, washed her hair and was ready for the day. And, and, she made her bed everyday! I loved her the moment she arrived and loved her even more while she was here with me. With her soft voice saying: “Yes Mam! Thank you Mam! in her southern most precious way……how could one not love her! 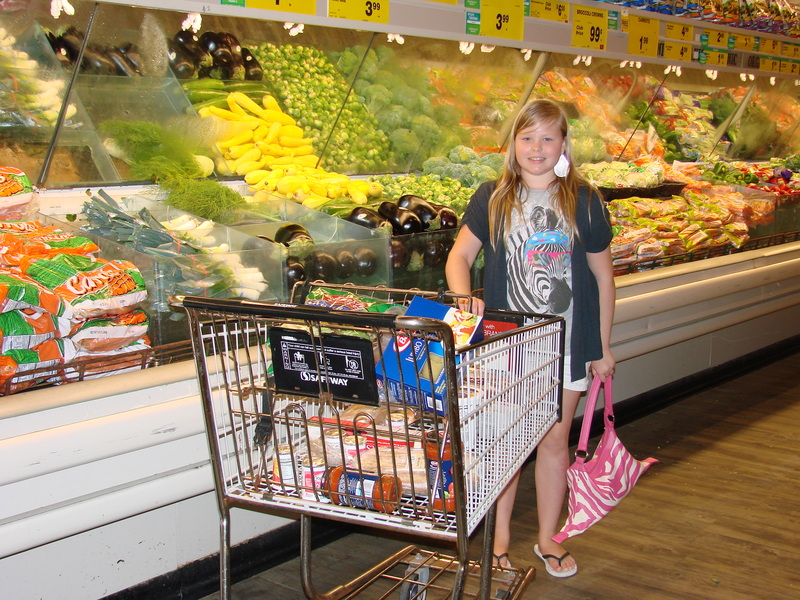 As soon as her parents dropped her off and left, we made a grocery list and headed to the store for ingredients that we were going to need for the dishes she wanted to learn to cook. Found the ingredients we needed! Tasted Crystallized Ginger for the first time! I could see by her eyes when she experienced the hot bite of the Ginger, she was quite surprised……..but, liked it! Dinner we had out on that evening, but as soon as we returned home we went to work to make a dessert. We made……. We used large butter cookies for the layers, and made the Vanilla Custard Cream. The strawberries were macerated with sugar and some lemon juice. There were three layers of cooky, berries, custard cream and all was topped with some unsweetened whipped cream. 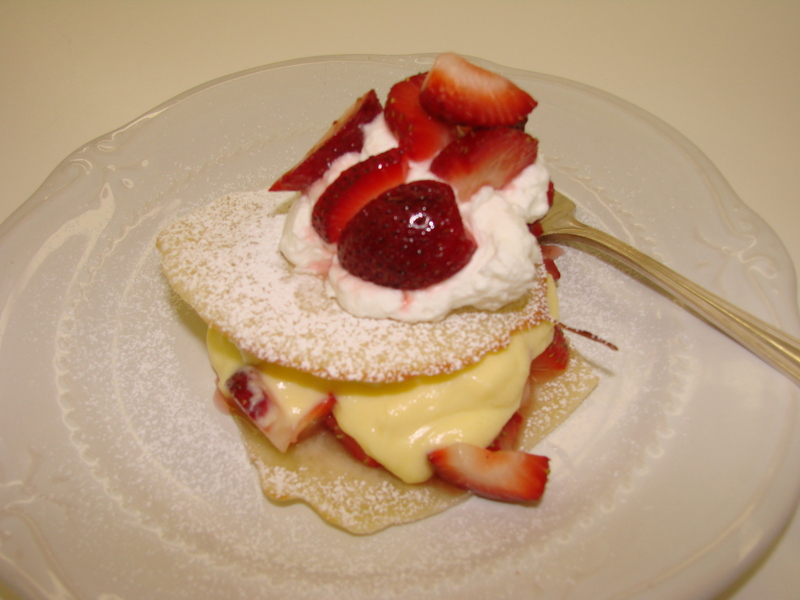 It was a quick way of making the Napoleons and very delicious! My little student was very pleased!!! 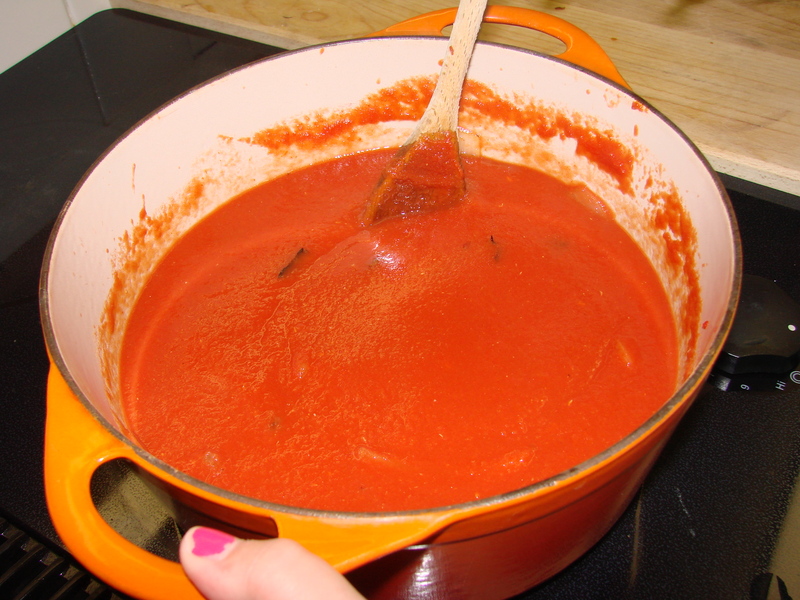 Into a sauce pan pour the 1 cup milk, add the sugar and cornstarch…… mix well until all lumps of the cornstarch disappear…..then add the egg yolks and mix well…….. Remove the cream from the heat …..and continue whisking until the color of the cream intensifies and the whisk is coated with the cream. If it did not thicken……return the cream to the heat and keep whisking and stirring until it thickens……. Do not boil the cream……it will curdle ……and you will have to start from scratch……. 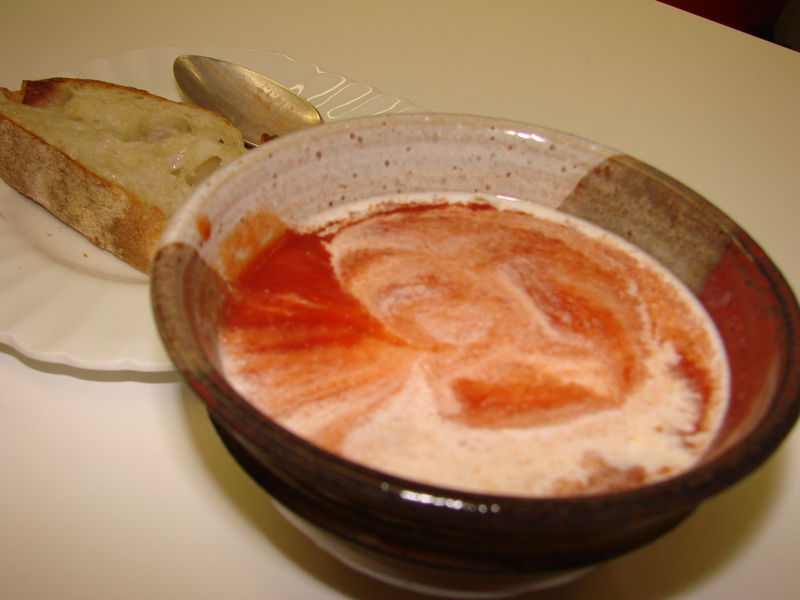 When cream has thickened transfer it to a cold bowl…..and cover with a plastic wrap. Cool at room temperature………then refrigerate until ready to use for the Napoleons. If the cream is too thick after cooling……ads a little heavy cream to thin it….. This day was our hardest ……we were going to really work and learn most of the recipes that she had on her list. We started with Crepes in the morning, and had them for breakfast! 1 ¼ cups milk or more till batter has the consistency of heavy cream. 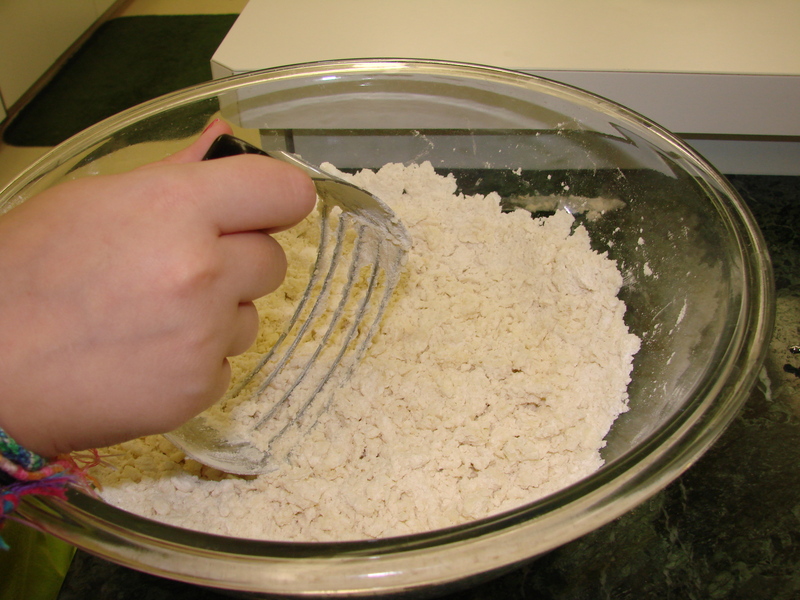 Mix the above ingredients in a bowl with a hand mixer. get all the lumps out of the batter. 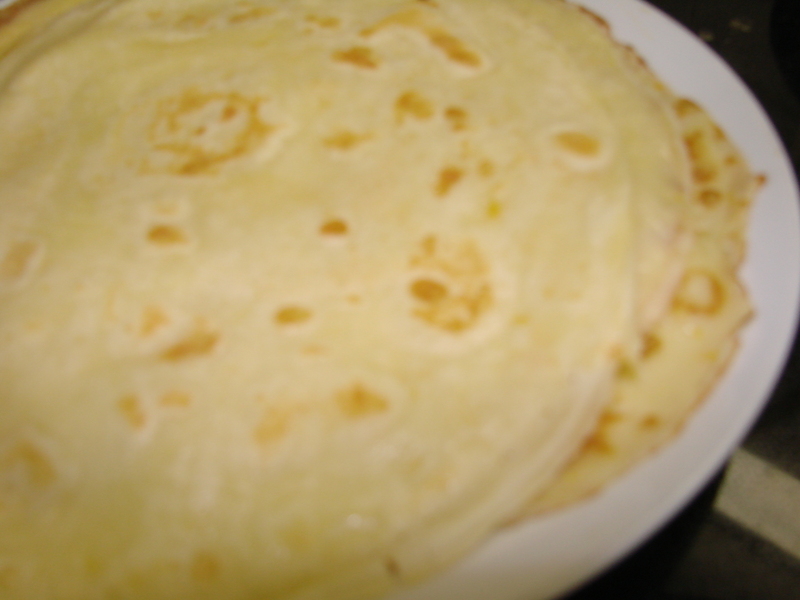 Bake the crepes in a very hot crepe pan. For lunch we made a simple Soup! In a Dutch Oven add 1 Tbsp of oil and the sliced onion. Caramelize the onion until light brown. Add the Crushed tomatoes and the Tomato Paste. When we finished with lunch we made two pastry doughs that needed to go into the refrigerator for a while. One was a pie crust and the other was a butter dough for cookies. At this time we cleaned up the kitchen and took an hour for some rest. We each went to our bedrooms and spent a little time to recharge. 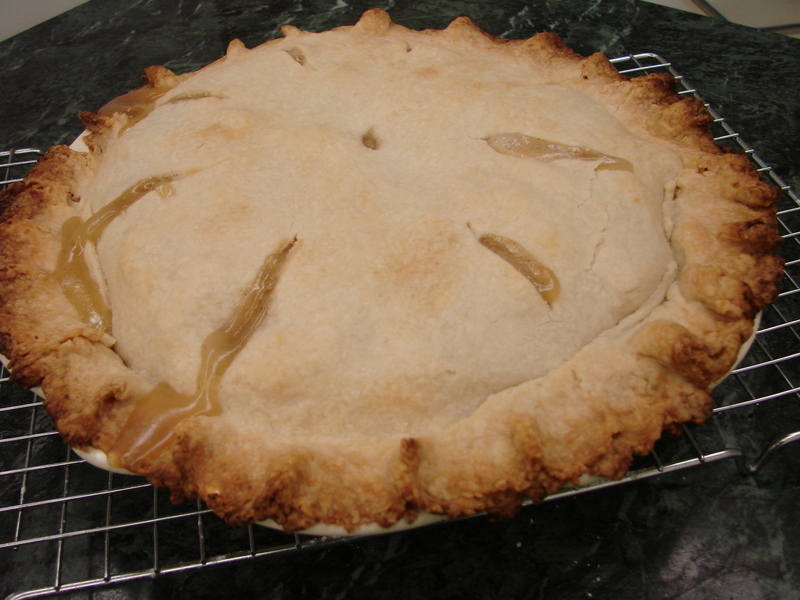 Upon returning to the kitchen we put together the peach pie. 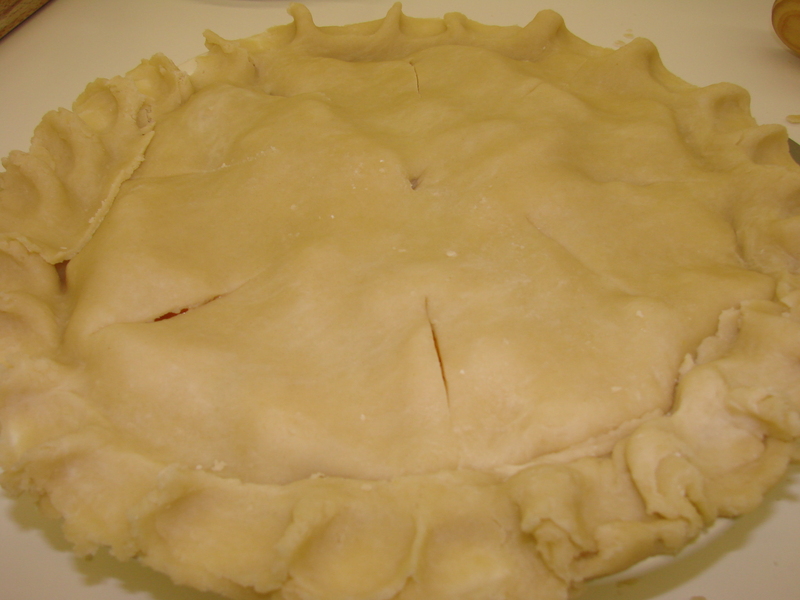 The crust pastry was already made and was taken out of the refrigerator to bring it slightly up in temperature. Here is how we made the crust and proceeded with finishing the pie. Mix together dry ingredients (flour, sugars, spices) in a large bowl. Stir in peaches and lemon juice. Add more peaches if desired. Adjust sugar as needed. Fill the bowl with the peach filling and cover with the second crust. Bake the peach pie at 375 F for about 40 minutes. If the pie gets too brown around the edges, cover the pie with a ring of foil. Fold a square piece of foil first in half and then again in half. Now cut the center out from the folded square of foil to make the ring. Bake the pie until golden brown! Dinner was next on our schedule. Wiener Schnitzel made with chicken breasts, and cucumber salad, dessert, of course was the peach pie. 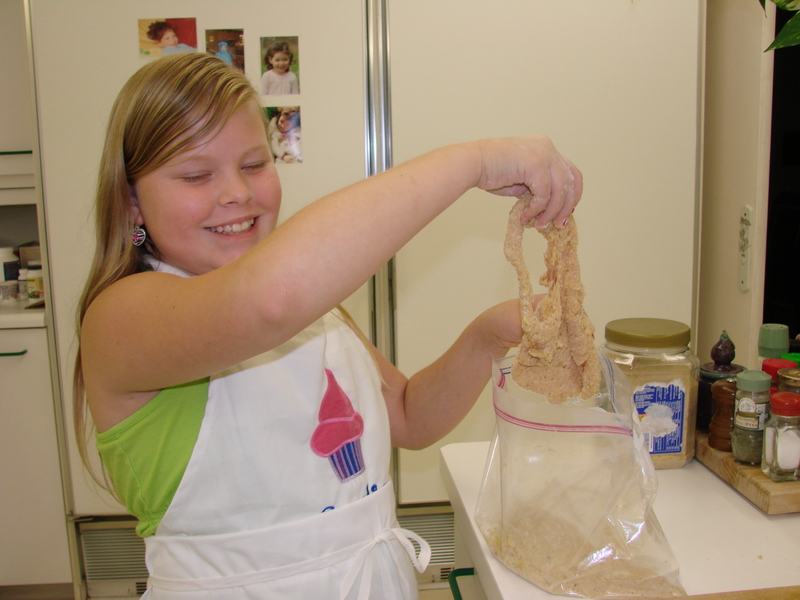 To make the Wiener Schnitzel with chicken breast, one has to first wash and dry the meat, then cut each one in half…. horizontally. We put two slices in a gallon size plastic bag and pounded the meat gently until it was very thin. The same procedure was done with the rest of the chicken pieces. The pounded chicken pieces were lightly seasoned with garlic salt. We took another gallon size plastic bag and added about 1 1/2 cups of flour, then another plastic bag was prepared with 2 cups of unseasoned home-made bread crumbs. 2 eggs were scrambled with a little water in a separate bowl. Each Schnitzel was first dunked into the flour, excess flour shaken off, then dunked into the bowl of eggs, coating it on both sides, then transferred over to the bag on bread crumbs. Then laid on a board to wait to be fried in just a little olive oil in a non-stick frying pan. Peel cucumbers and scoop out the seeds, slice them in a food processor with a #1 blade. This can be done the day before and kept in the refrigerator over night. The next day, just before serving add the sour cream, zest of a lemon and its juice. Add the mustard, garlic salt and dill to finish the salad. Mix gently until all the cucumber slices are coated and serve. After dinner we made a Quiche which we refrigerated for our dinner the next day. Spray the baking dish with Pam or grease the Quiche pan with Crisco before placing the pie crust into it. Add the chopped ham and the grated cheese into the unbaked Quiche pan. 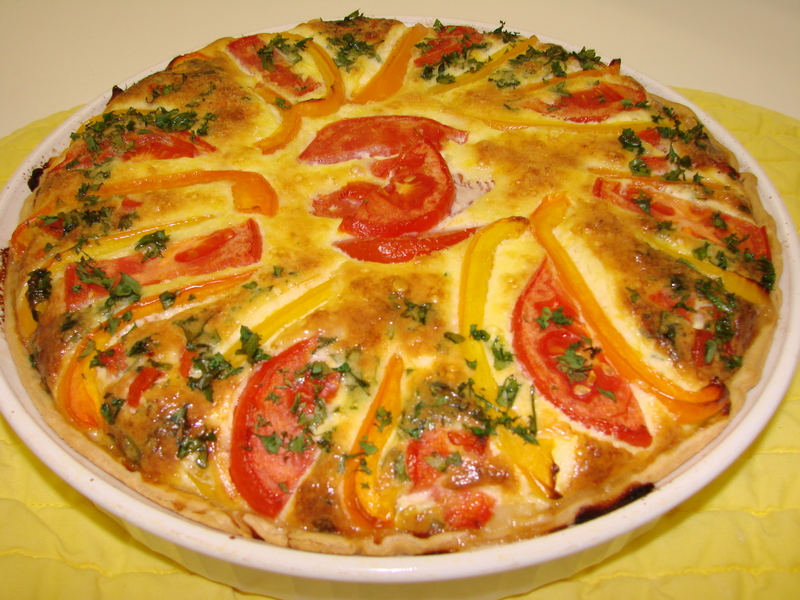 Optional…….add and decorate the Quiche with slices of tomato and bell peppers. Bake in a preheated oven – 350 F for about 1 hour – or until Quiche puffs up and begins to brown. Bake on lowest shelf in oven to enhance browning of quiche’s bottom. Let the Quiche stand for a few minutes before serving, or if not served immediately let it cool and freeze until ready to serve. This day we spent at Baltimore’s Inner Harbor. 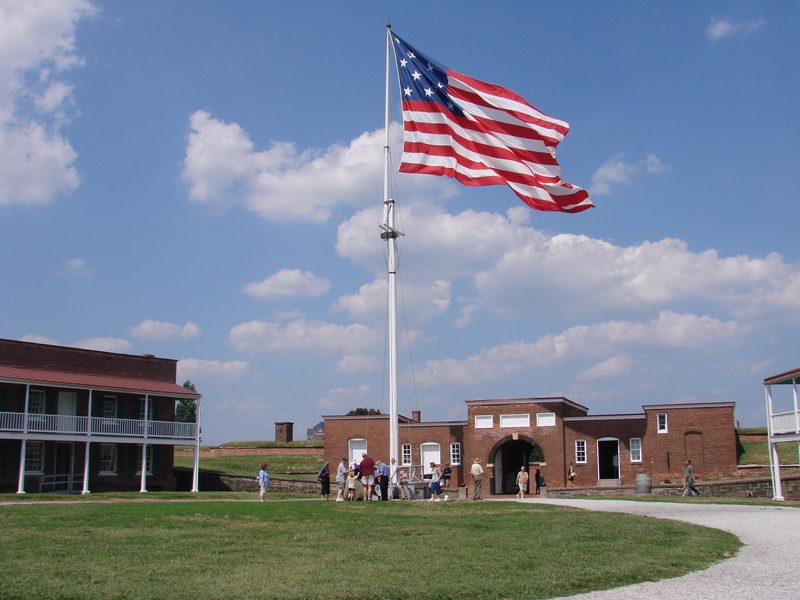 The Science Center was of great interest and after lunch we took a Water Taxi to Fort Mc Henry where the largest United States Flag was grandly displayed and was proudly flying the breeze. Dinner was the Quiche that we prepared the evening before with a bowl of ice-cold fruit. No sooner did we clean up after dinner when – my little cook was ready to cook some more. 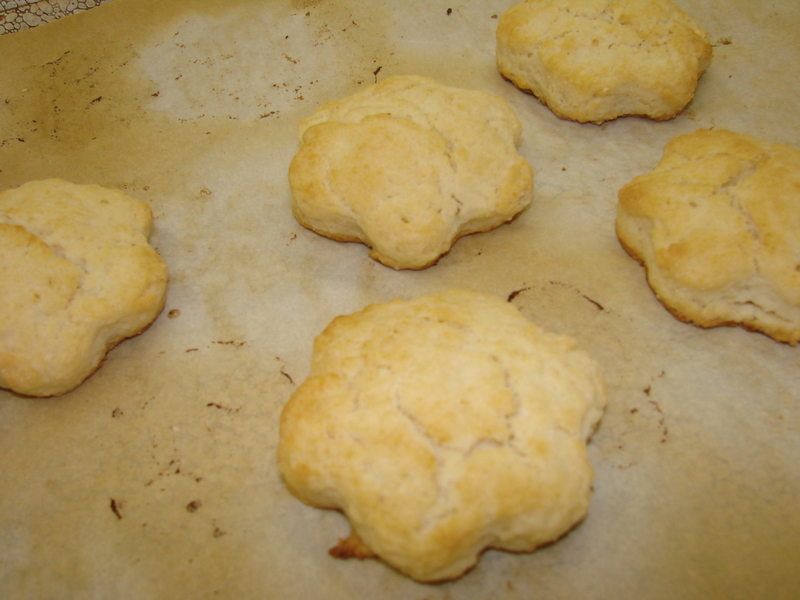 Out of the refrigerator came the butter dough and while it was warming a bit, we made Buttermilk Biscuits. A simple recipe from one of the Southern Living Cookbooks. Knead 3 to 5 times. 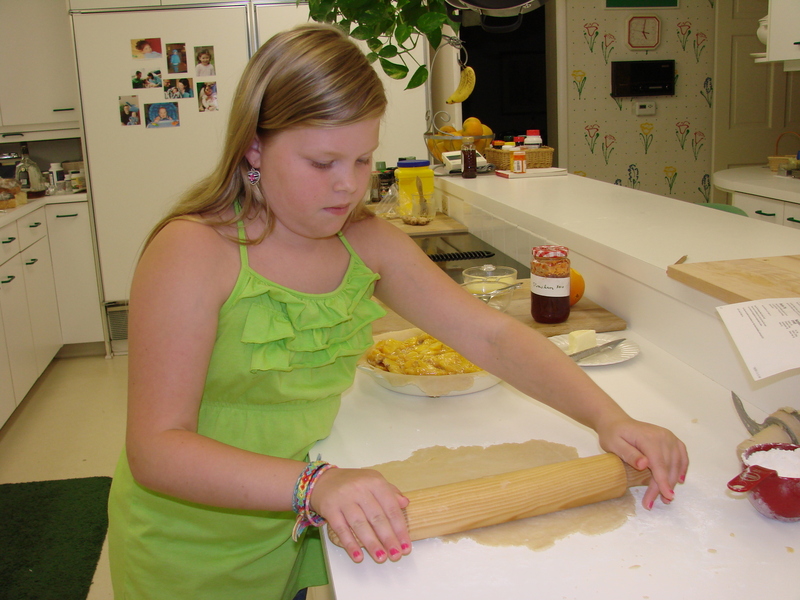 Pat or roll dough to ½ inch thickness, and cut with a 2 inch round cutter. Place dough on lightly greased baking sheets. re-roll excess dough, and proceed as directed. Brush with ¼ cup melted butter. Bake at 425 F for 10 to 13 min. or until golden. The butter cookie dough was just the right temperature when we finished with the biscuits. 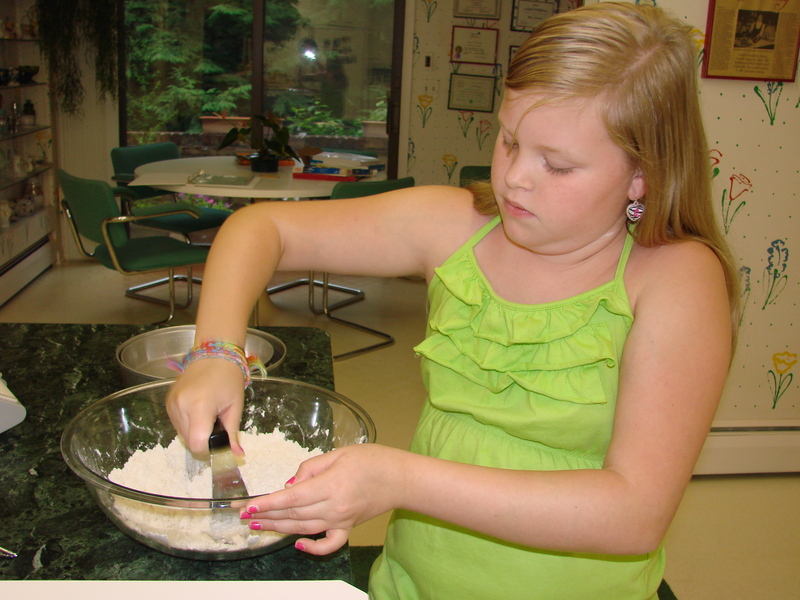 Process the above ingredients in a Food Processor to make a dough. Let it rest in refrigerator for 30 minutes or longer. When starting to work with the dough it should be cool to the touch. 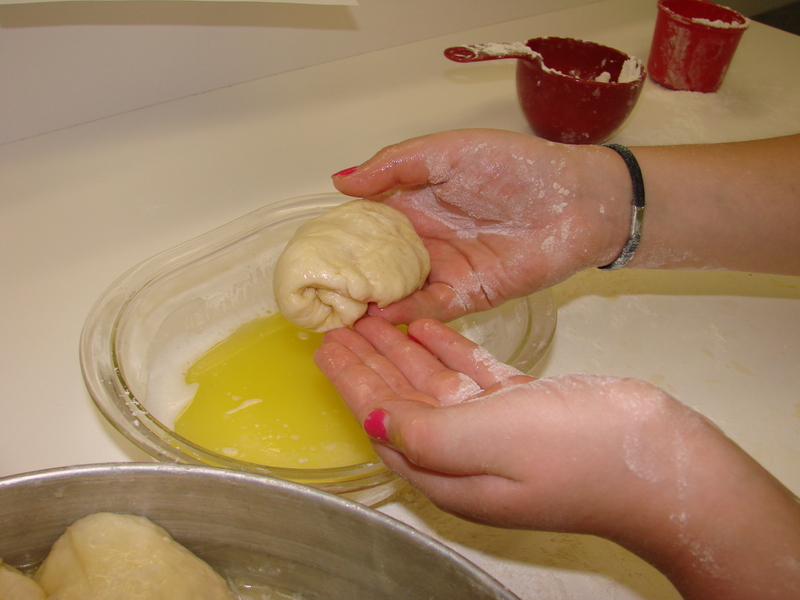 Cut the dough into four sections and roll each piece on a flouer dusted surface…..to about about a 1/4 inch thickness. Use cookie cutter to make any shape you like. Bake this pastry in a 375 F oven until barely browned. 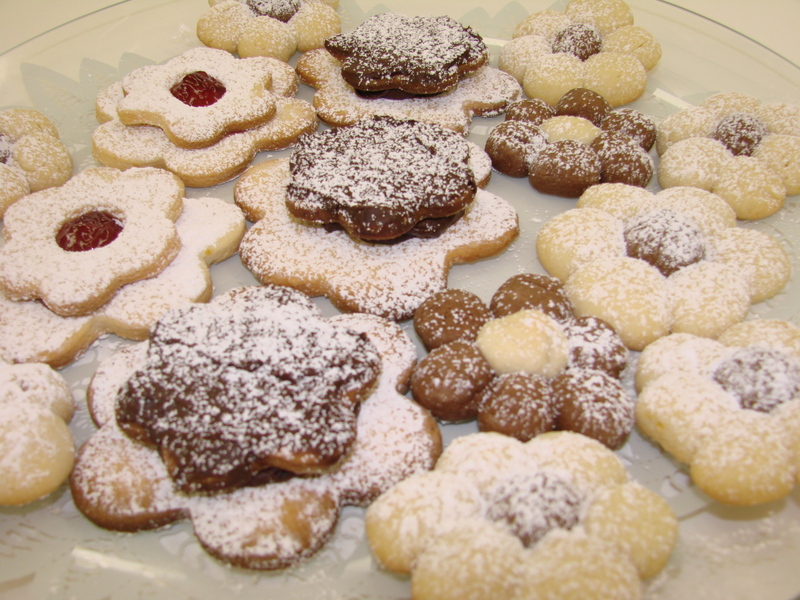 Here are the different cookies we made! Sunday morning we went to church and after ward we visited an Herb Garden at the Historic Hampton Mansion which was near our church. My little cook wanted to start an herb garden when she got home and wanted to see what one looked like. 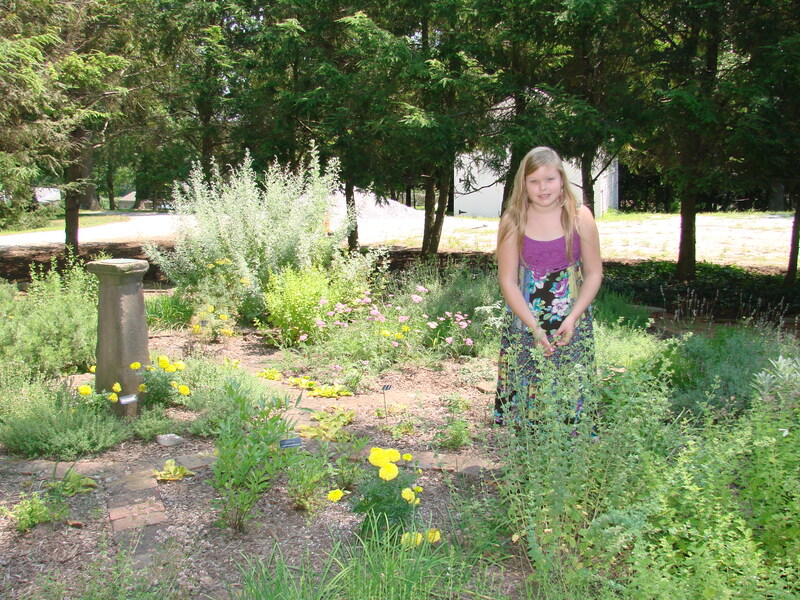 It just so happened that the Garden Club that I belong to is maintaining the Historic Hampton original herb garden. We talked about the herbs, rubbed and smelled them, she learned how they are used and in what dishes that they are most prominent…….and in what countries that they are favored. 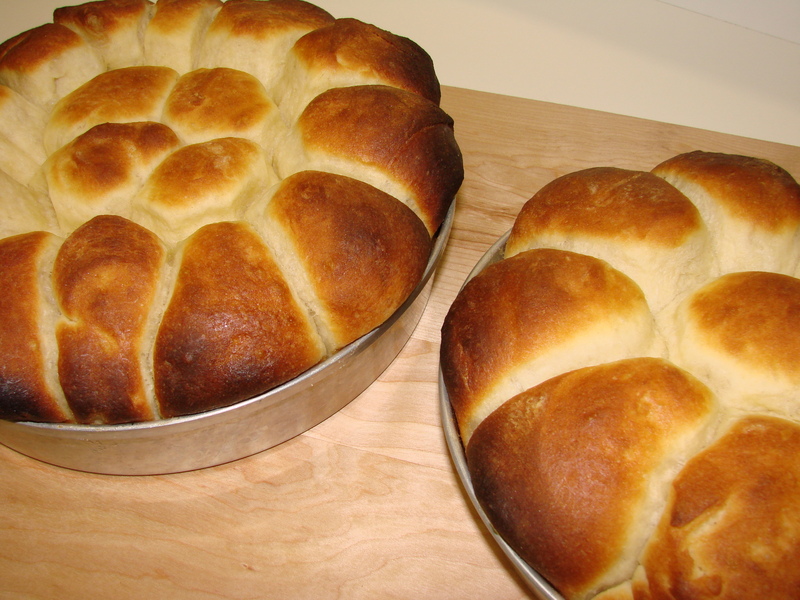 We had omelets for lunch which I prepared and then we needed to do one more recipe that her mother requested……….dinner rolls! Use a medium size bowl…. 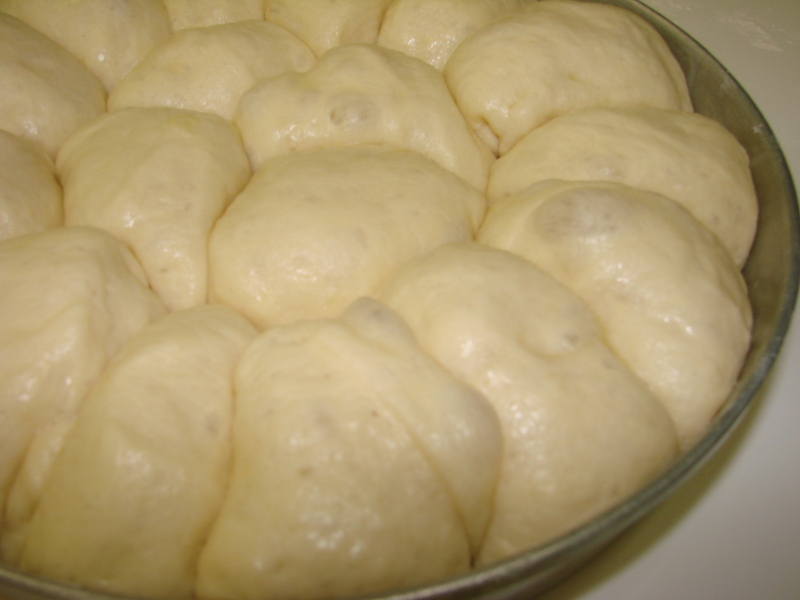 Mix well…….for about 3 minutes…….the yeast dough has to become stringy…..in the bowl. Cover the bowl with plastic wrap and let the dough rise in a warm place…about 40 minutes. 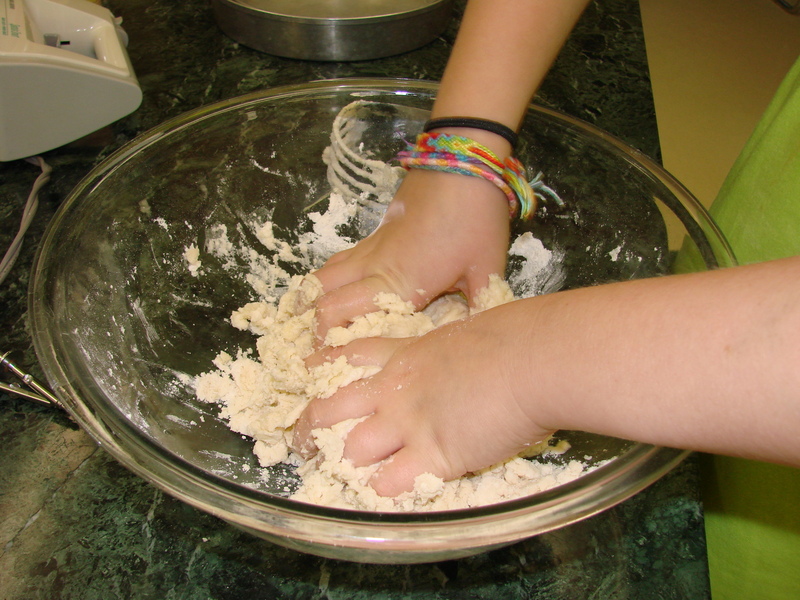 Transfer the dough unto a well floured surface and knead for several minutes. Dunk the rolls into melted butter and place them into round baking pans. Let the rolls rise another 30 minutes or so…..and bake them at 350 F for about 30 minutes or until nicely browned. If the tops gets too quickly brown……cover the rolls with a sheet of foil to prevent the rolls to burn. Auntie Maja’s Cooking Camp….. ended the next morning when I took my little cook to the airport and handed her over to her father who came to pick her up to take her home to Georgia. 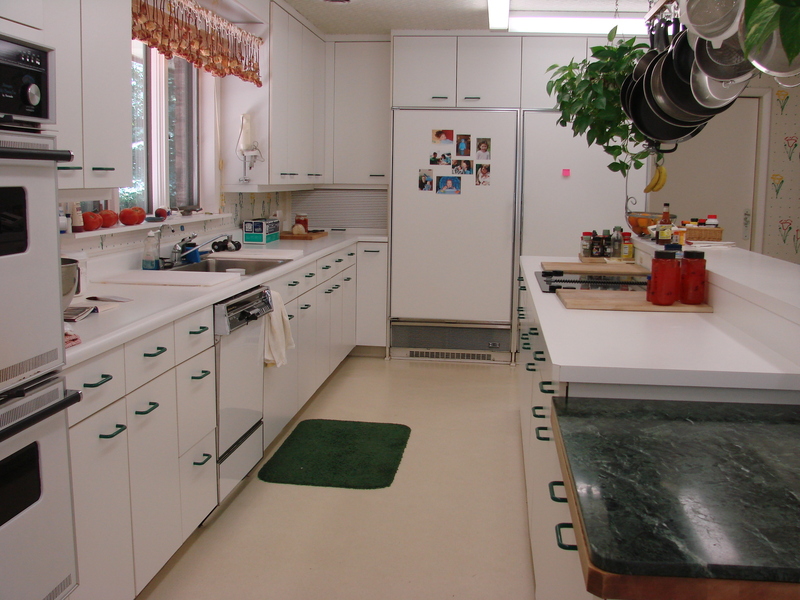 It was a strange feeling when I returned home to an empty kitchen. I missed the whirlwind activity and the gentleness of this little girl who was so eager to learn all she could in just four days. And, she is only 11 years old! Hope you click the LIKE button?! What a charming, entertaining post! From beginning to end, it was complete fun to read and I know your recipes are all wonderful. You have/had a very lucky student who appears to be quite talented too (not to mention pretty)! Between you and I, I breathed a sigh of relief when I saw that you too use a Pillsbury Pie Crust once in a while ;-)! Melanie…….I actually use the Pillsbury Pie Crust quite often…..mostly for Quiches……I find that people leave the crusts on the plate more often than eating it…….so…….why go through all the trouble of making a crust?????? Thank you for your very nice comment…..I already have had inquieries about youth classes………who knows this might be a beginning of a new phase in Maja’s Kitchen………I am always open to try something new! What a gorgeous, skillful and brave little girl she is, and what wonderful dishes you two prepared! 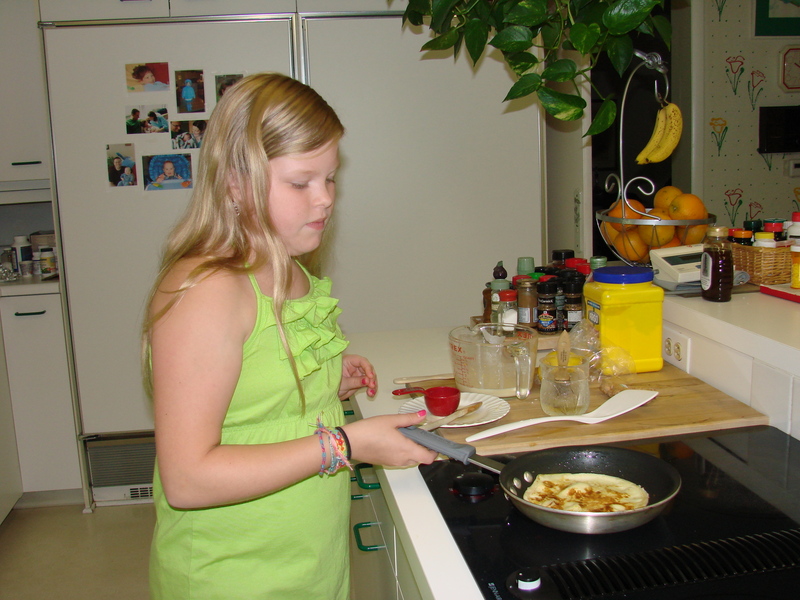 If all the kids this age would spend time in the kitchens with their moms or aunties, daddies or uncles, learning to prepare healthy and delicious food we would be a lot less of an obese nation…. Nina………thank you for your nice words……it was great fun for me! 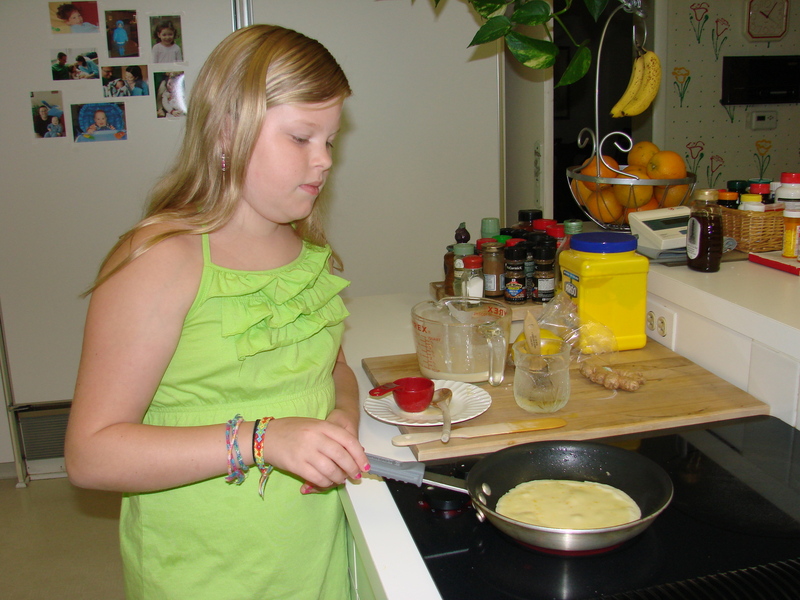 I so agree with you about children cooking with their family in their homes…..but, the problem is that many moms and dads do not cook at home…..we need to teach them to do the cooking first…….However, as cooking teachers, we need to grasp any situation that is offered us to teach preparing healthy meals when ever we can……. Thank you again for your very nice comment…….I so appreciate hearing from you……….. Wonderful post! 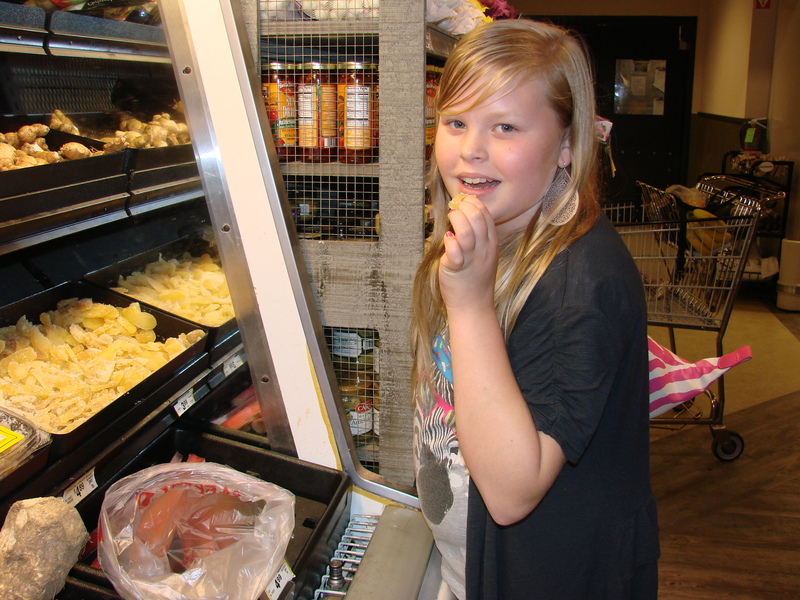 I am shring this with Tiffiny our 11 y/o grand daughter who also loves to cook. She helps her dad almost every night as he prepares dinner. Rob has cooked for his family since April and he got married 17 years ago! Tiffiny and her dad did a Thai whole fish in banana leaves the other night-they send photos as they do this from the iPhone. Last time Tiff and her 14 y/o brother had a sleep over we all made Cataplana w/chorizo, shellfish, tomatoes, peppers, garlic, etc. Other times home made ice cream, cut roller pasta, filled ravioli, meatballs, Chnese sticky rice parcels, Vietnamese Salad Rolls, etc. We will have them for 4 sleep overs in August. Any suggestions what to teach them? What a clever idea and the story of all events is beautifully told. I read this and I think-I just you and what you do and ‘how’ you do it Maja. What a lovely soul God gave you and how sweetly you put it to good use…..a lovely spirit and an inner strength and you create such special treasures in your kitchen and in your stories. Keep them coming …..you are what this tired old world needs-a breath of fresh air! Thank you my friend. I left out an important word in first sentence-I just love you and what you do….. 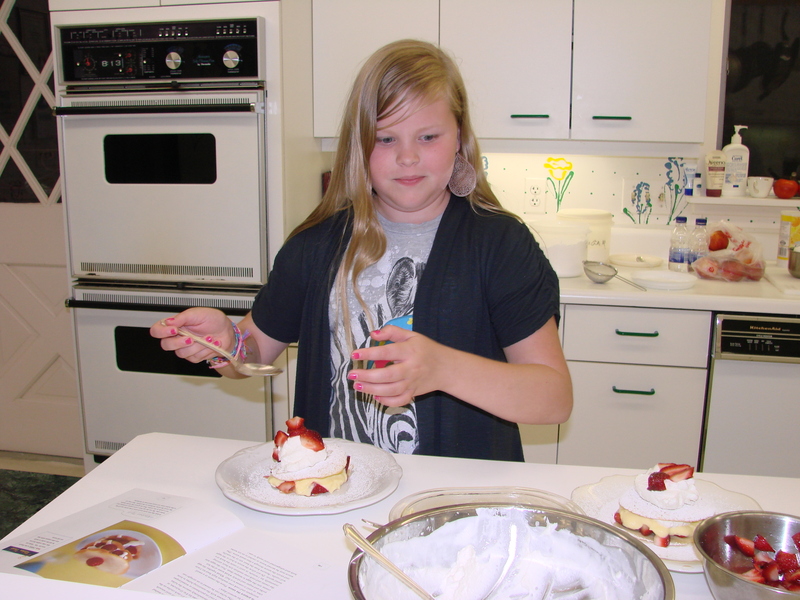 Loved your youth cooking camp posts with all the great recipes, Maria! You might like IACP’s Kids in the Kitchen Facebook page. Two questions about the dinner roll recipe: How many servings does the recipe make, and how many layer cake pans do you need? Thanks so much! 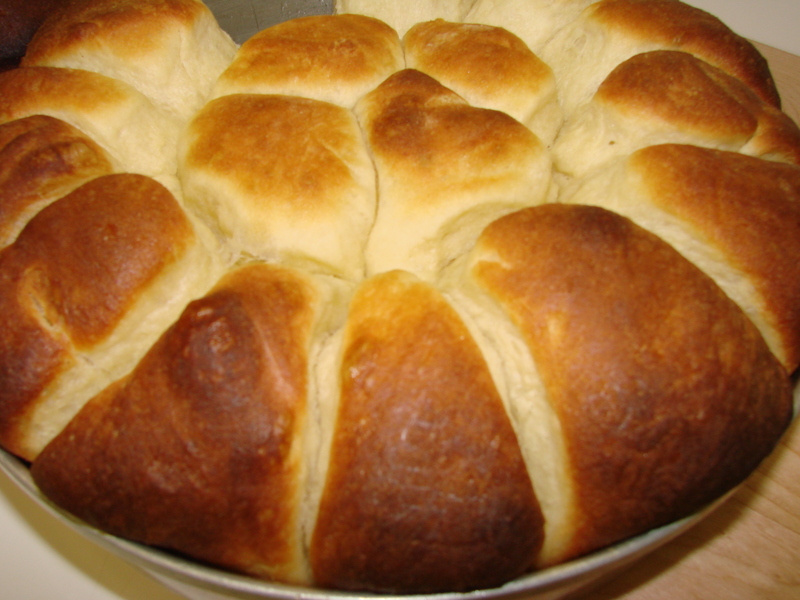 About the dinner rolls……….I used a 9 inch and a 8 inch pan…….and I think we made about 24 or 26 rolls………..hope your summer is going well! Wish my granddaughter was a little older! Hi Malone clan, I do not know if all of you subscribe to Maria’s cooking blog or not. 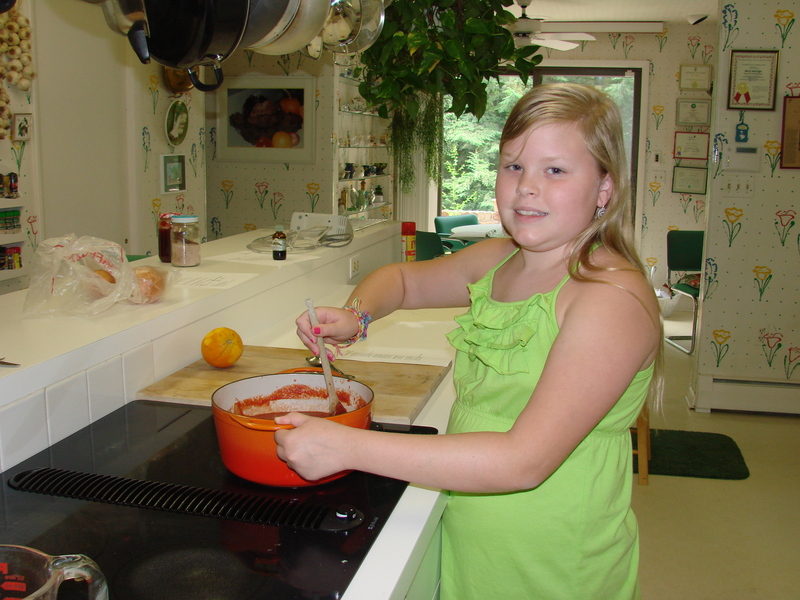 Thus I thought I would forward on this wonderful write up she did about Caylin at cooking camp. What a family treasure -magnificent gift- for Caylin to be featured in Maria’s internationally acclaimed* blog. 50 years from now Caylin can show her own grandchildren online what she did the summer she was 11 years old. The house is getting back to normal following Caylin’s session of Auntie Maja’s Cooking Camp. Debra and Meredith (Connie’s daughter) have experienced this in the past. The kitchen was covered in flour and powered sugar. I gained 4 pounds in 5 days sampling all the goodies (maybe it was more than sampling!). I don’t remember all the recipe names, you will need to ask Caylin. I was saved by the one day of recess when we walked all over the Baltimore Inner Harbor. In the attached photos please note that there is only one Georgia Peach. Sue, watch out, in the future not all the peaches will go for home made ice cream. Caylin makes a great peach pie. Besides teaching her the wonders of your kitchen and sharing your expertise, you gave her lasting memories that will take her into the future! I foresee a time when perhaps she returns with her child to revisit the joy! Additionally thanks for sharing the recipes. 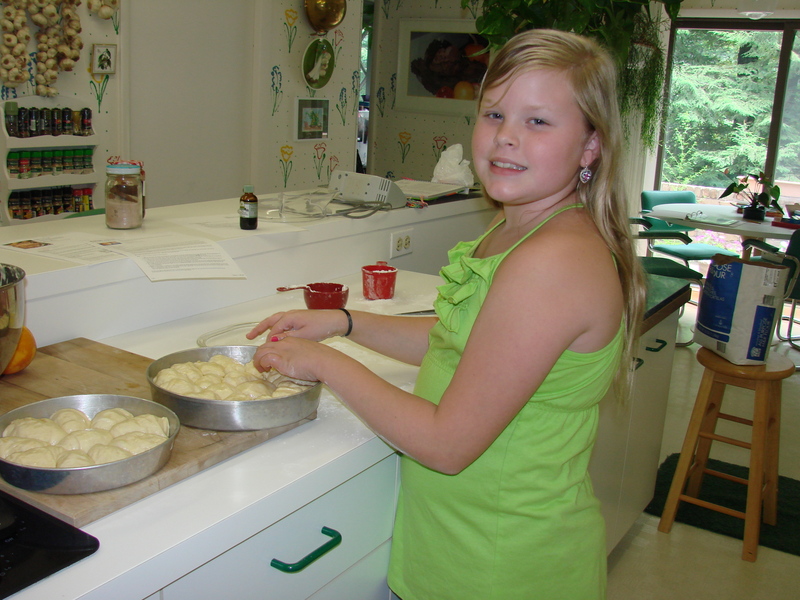 I remember Auntie Maja’s cooking camp and I am sure Caylin proved to be one of your BEST campers ever. Thanks for posting all the recipes. It looks like you two had a ton of fun together, which means that Uncle Dale probably never had the chance to complain about being hungry. 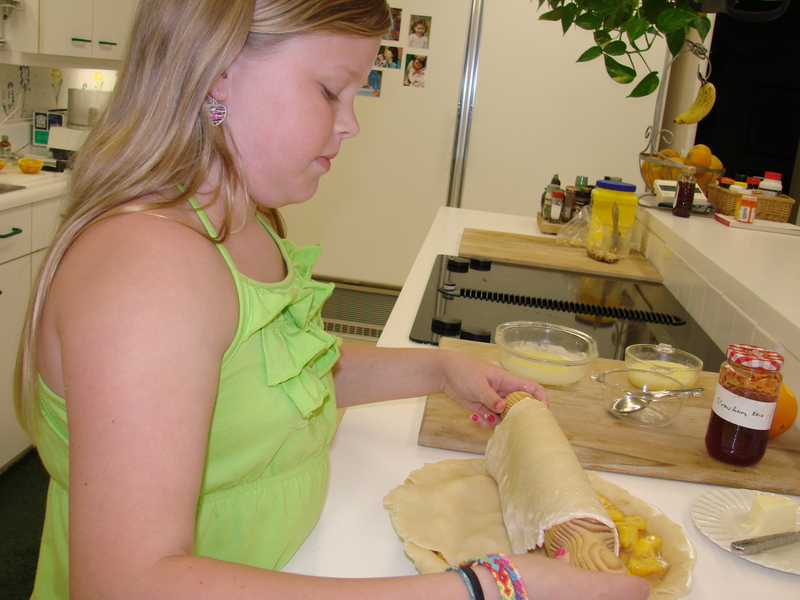 What a remarkable lady and equally remarkable little one to enjoy time together cooking and learning. You both are amazing, and it looks like a lot of fun! Beautiful blog entry, makes me wish I was a youngster again. Hugs from the farm, Maja! Really enjoyed this blog, Maria! What a wonderful experience for you both to share! 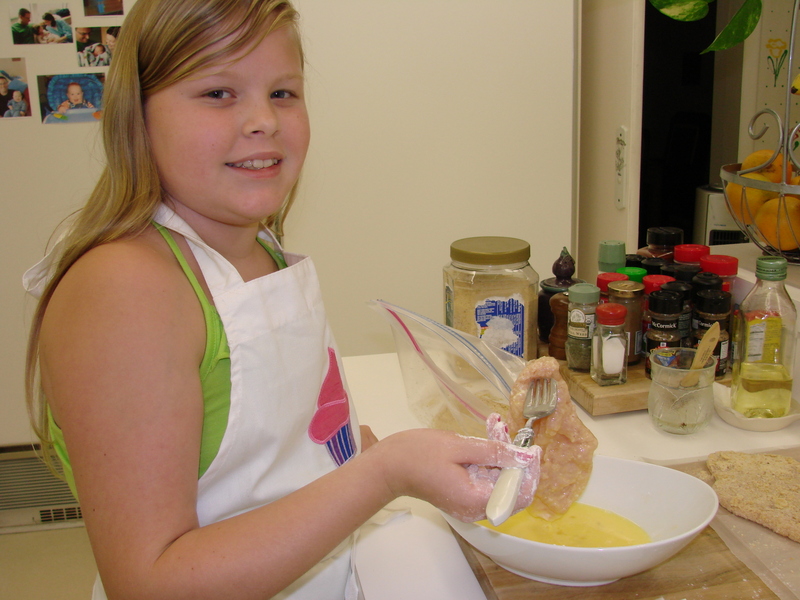 Donna……….thank you for your comment……it truly was very enjoyable……little Caylin was a wonderful student!